My dad and my brother came in to town this weekend. I figured because they were in town so close to Thanksgiving that I would make Thanksgiving dinner for them and then I also invited over the in-laws. We had enough food for an army that's for sure. But it would not be my style if I did not have enough food for an army. Phil's dad brought us over his turkey fryer so we deep fried our first turkey. Phil first injected it with creole butter and rubbed the outside with creole seasoning. We love the creole butter for injecting into roast chickens so we figured it would be really good in the turkey as well. Phil just messing around,getting prepared case! Our spread, way too much food! We had the deep fried turkey, brown sugar and mustard glazed spiral ham, corn, creamy mashed potatoes, apricot cranberry chutney, crescent rolls and pumpkin cake roll for dessert. Our chef at my work made the apricot cranberry chutney last year at our Thanksgiving lunch. It was so good that I asked him for the recipe. So I ended up making it for our friends Thanksgiving last year after I had it at work and everyone really liked it. My brother says that it tastes like you would think potpourri would taste like. Which sounds so disgusting but it is a very good comparison because it does have a very sensual taste. It is a good new twist to cranberry sauce. In a medium bowl mix together the apricots, cranberries, raisins, cinnamon, ginger, allspice and cloves. In a saucepan boil the water with the sugar until sugar is dissolved. Add in the dried fruit mixture and vinegar, bring to a boil. What a wonderful chutney... you are very brave deep frying your bird. 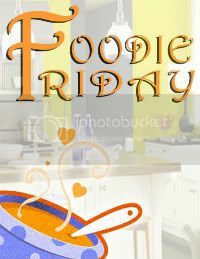 Happy Thanksgiving and thanks for stopping by foodie friday. Nice flavours in this chutney. The tart cranberries and acidic apricots would work very well with the sweet raisins. I'm looking forward to giving this one a try.